If you give Kate the dates of birth of yourself and your partner she will use her expertise to find out how compatible you really are. It is an ideal gift for your friends and family who are looking to find love. Ultimately - a relationship is usually what you make of it but understanding the possible pitfalls helps greatly. Find out more by speaking to Kate. E mail reading - Cost £15. A palm reading can show you how to make the choices for your future; providing you with reassurance should you decide to follow a new path. What is the meaning of the various lines etc. Let kate - who is a consultant in palmistry for the British Astrological and Psychic Society - guide you forward. Your destiny is partly already written and partly to do with choices you make. A palm reading can help with important choices in life. "Your destiny is what you make it, it is up to you to bring about change; a reading can help you find your way." Kate uses her psychic ability to read the tarot cards with amazing accuracy. Kate can help to read your destiny and give you guidance using the cards. If you would like to contact her for a tarot reading then do not hesitate to call or email Kate. Kate uses her expert knowledge of astrology and with the aid of a crystal ball, she can predict future events and give you guidance and help within your life. If you would like to know more about your future and which path you should take, let Kate help you. 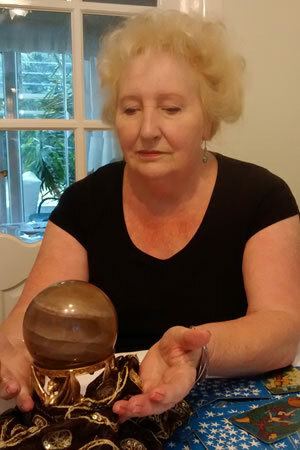 If you would like to contact her for a crystal ball reading then do not hesitate to call or email Kate. Kate loves to be able to attend your event in person and will happily do so within a reasonable distance of her home in Solihull, West Midlands. However, for more distant events, she offers Skype sessions at £60 per hour. These work very well as the time booked can be shared between the guests.This is a firm favourite with the ladies in Dubai for instance but also the fun loving lasses in the North East seem to enjoy this. To book Kate please phone 0121 745 1975 or you can get her on her mobile 07885514518. If you would like to contact Kate regarding her services then use the details below or the contact form provided.